NECA's Future Leaders are the next generation of electrical contractors, as well as the next generation of NECA's leadership. This conference connects emerging professionals by offering events focused on networking and discussions topics to enhance their leadership skills and increase their involvement within the association, community and the industry. All emerging electrical construction industry professionals employed by a NECA member company or chapter are invited to attend. Future Leaders Conference attendees are responsible for their travel and hotel reservations. 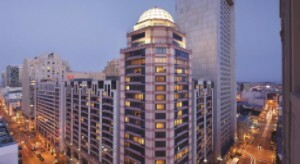 NECA has secured a standard room rate of$279/+taxes& fees/night at the Hilton San Francisco Union Square Hotel. Hotel cut-off date is April 25. Get the discussion going around what perception is and how powerful it can be and understand your unique personality style. Note to all participants: each registrant will receive a link to complete an online evaluator. The test should only take about 15 minutes to complete. When you are finished, results are automatically sent to the Discover Yourself offices for processing. Your data will be analyzed and your unique Insights Discovery Profile will be produced and distributed during the program.Please complete the online evaluator no later than May 5or before.